I've been designing bedding and pillows for almost seven years now so you could say I have a good idea of what goes on in the bedroom. But why is it that the bedroom is the last place we tend to spend our energy and money, but it's the place we spend the most time? I'm guilty of the same thing, our bedroom is fine, but not designed. In my years, I've looked at a lot of bedrooms for inspiration and often find Boutique Hotel rooms the most exciting. These rooms transcend trends, but in the most hip and aspirational way. There seem to be no rules, but there is also a tangible sense of restraint in theses spaces. I can't get enough of this room lately, but could you pinpoint the particular style besides, well, perfect?! You've got a deco glam thing going on with the faceted mirror, an interesting color combo of reds, rust and light blue, and some menswear textures going on with the plaid pillows and leather and nailhead detailing on the chair. The molding is traditional but then the corners are irregular and who came up with that? !...Brilliant is who. So, let me transport you to some of my favorite far away places I have never been. 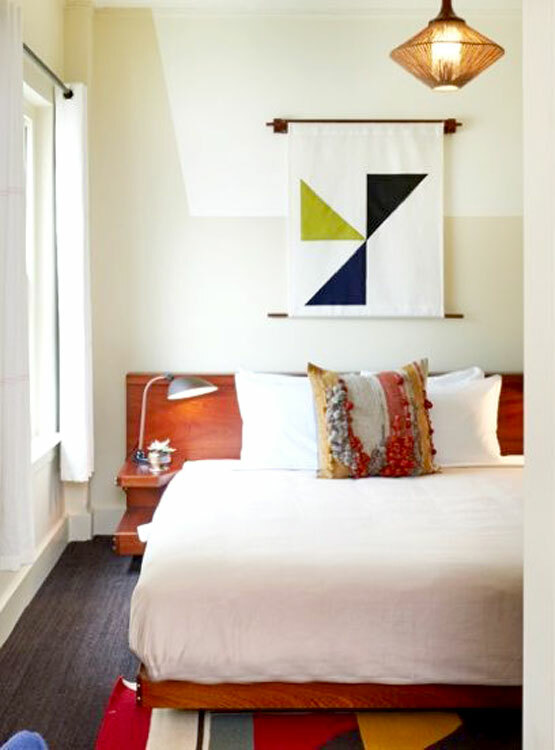 I'll break down some of what makes these rooms so special and let you in on some designer secrets that can help you get the boutique hotel inspired bedroom of your dreams. Too much pattern keeping you awake? Put it behind the bed, you won't see it when you're trying to sleep. I'm an advocate for mixing patterns and always present it to my clients in a very tailored way. 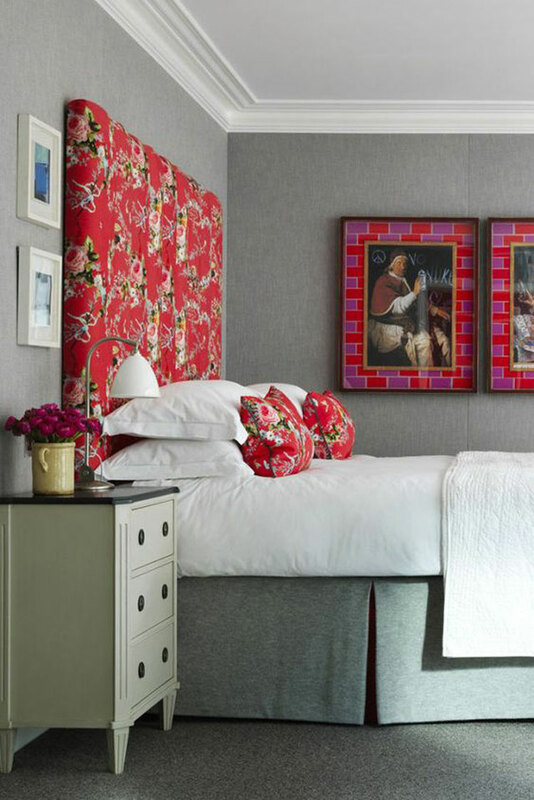 Kit Kemp, the designer behind many boutique hotel rooms is a master at it, sometimes pairing a patterned headboard with patterned wallpaper. Another option for bringing pattern behind the bed is to do wallpaper or a mural. Doing wallpaper on only one wall is tricky, it can look a bit half-assed if you aren't really intentional with the rest of the room design. 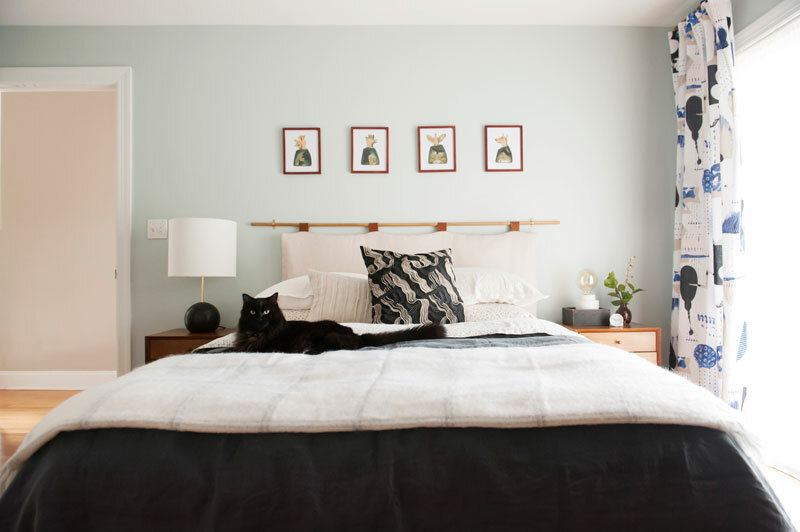 My girl, Emily Henderson has pulled it off in this bedroom. There are so many options for removable wallpaper these days, even if you rent you can still have wallpaper! As if in response to bad statement walls, murals have been popping up everywhere. I'm loving vintage palms or historic pastoral scenes paired with modern accents. I love the marbling and the watercolors and the photo realistic florals. Unlike wallpaper, these are meant for only one wall and many can be printed like wallpaper or for a temporary application. Head down the Pinterest rabbit hole and see what options are out there to fit your sleep style. Etsy is another go to for murals and led me to my favorite line, Anewall. Read how I used it in my house here. Choose simple bedding with an interesting detail. Most hotels keep crisp white bedding tucked in so tight it kind of hurts your feet. What often differentiates regular hotel bedding from boutique hotel bedding is the detailing. Notice the contrast satin stitch on the bedding above. A single, double, or triple row of satin stitch is the most common "hotel look" in bed linens. You don't have to get too crazy with it, but when looking for bedding keep it simple, but look for a thoughtful detail that makes it look high end and tailored. Look how black is used in this hotel room to polish and make everything pop. Without these black accents this room would be monochromatic and bland. I'm a big fan of black accents in all places and I can't wait to own my own home so I can paint some trim black! Lighting, mix it up. Know the rules and then break them. The first time I cohabitated I thought it was a sure sign of adulthood when I managed to get matching nightstands and lamps. Let's not get into what they looked like, but they were there, the proud pairs. It's definitely a master suite look that can feel a bit tight and stiff in smaller bedrooms. I want to show you the alternatives out there taking inspiration from boutique hotel room lighting. Many more modern boutique hotel rooms have wall sconces rather than bedside table lamps. Hotel Bienvenue in Paris mixes it up with an asymmetrical set up. Wall sconces are having a moment right now so you will find lots of options at different price points and styles for both hard wired and plug in sconces. Sites like Lamps Plus have a way to filter searches for either. The image above has been another inspiration for my upcoming bedroom redesign. Notice how the hanging light cords become a design element. Also peek at those mismatched side tables! Mismatched side tables and lamps can come together for a designer look in the bedroom if you get the right proportions. The key is to vary the size and shape so it looks intentional rather than you just couldn't quite match them up. So many bed and headboard options these days are low profile and barely hit 36" in height. This can pose the problem of what to put over the bed to take up that extra space. 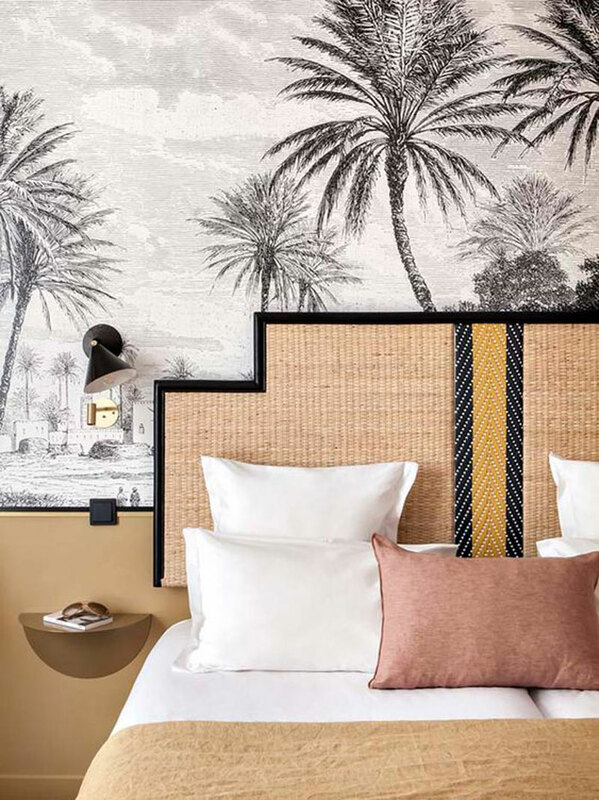 We can take inspiration from boutique hotel rooms and rethink the headboard, or add the illusion of a headboard and make it the focal point of the room. 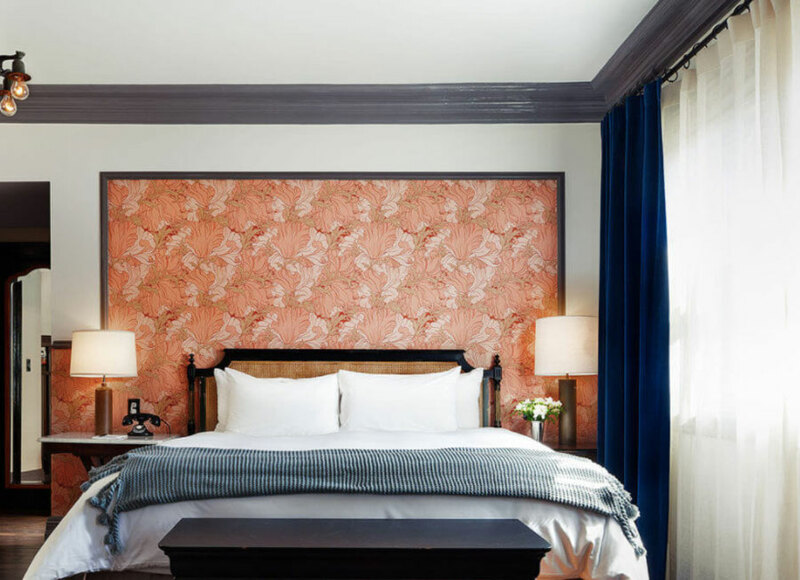 A first choice of mine would be to add pattern, the Line Hotel in NY shows us that wallpaper framed out in molding is also a great option. If you only want to wallpaper one wall and your bed happens to be on the same wall as your door, this is a great way to contain the pattern and make the bed set up look more symmetrical. 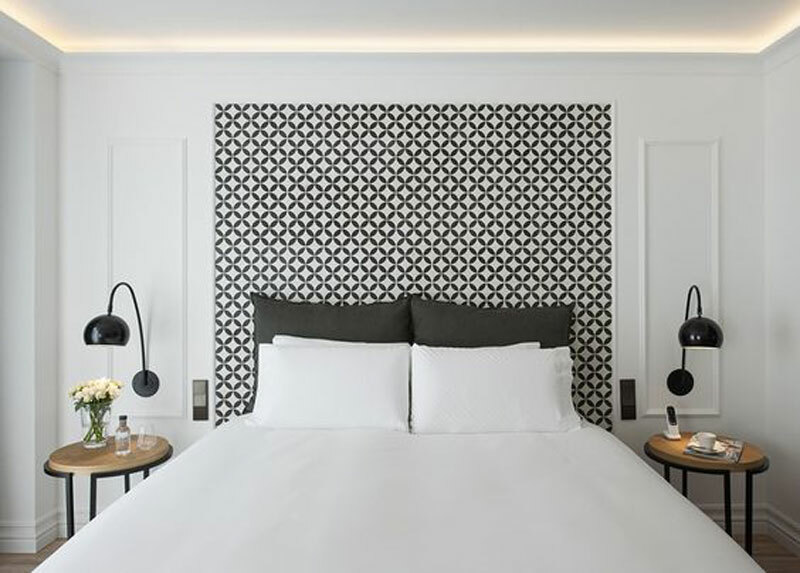 Clean and simple, the Serras Hotel in Barcelona has a monochromatic palette of black and white with a graphic pattern behind the bed framed out in decorative molding. That cove lighting is also a nice touch. This is wallpaper, but this pattern could easily be achieved with a wall stencil. The Hotel Sereno in Lake Como by Patricia Urquiola, photo by Patricia Parinejad. 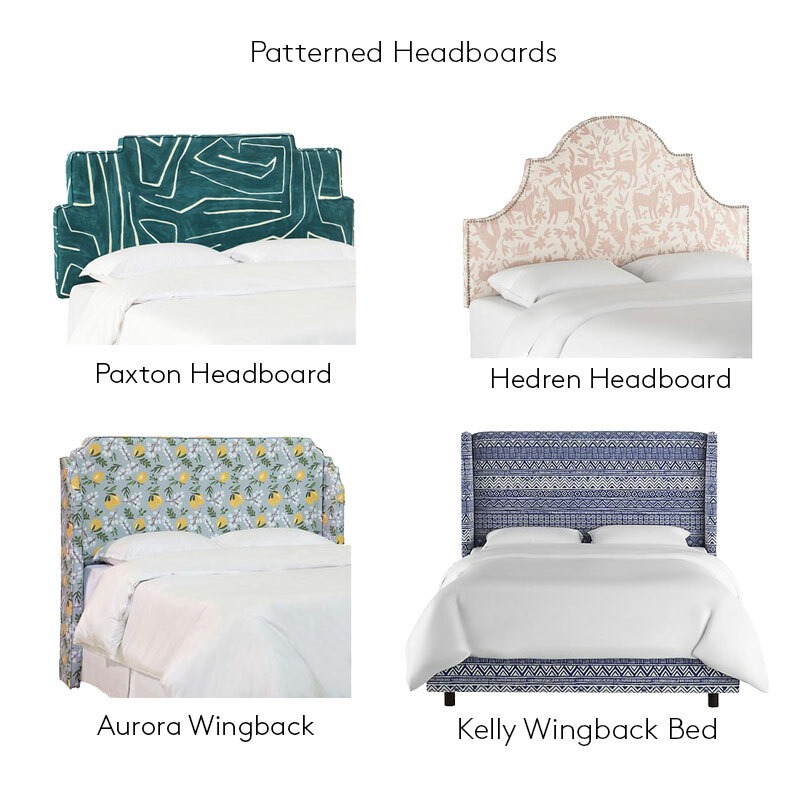 Patricia Urquiola is one of my product designers and her headboard design for the Hotel Sereno in Lake Como, Italy was the inspiration behind my DIY headboard. I love the look, but we've since upgraded to this bed from Hedge House furniture, which is located in northwest Indiana, not far from where I grew up. You will see it when I reveal my fully designed bedroom coming soon! A super graphic option that is easy, but so impactful, takes only a quart of paint and an afternoon. You could do something asymmetrical like you see in the Paris, Rive Gauche Hotel Henriette. If high contrast isn't your thing consider something a little more tonal like you see below at the Freehand Hotel in Chicago. Unlike every other room I have featured on this post, I thought I would end with one I have actually stayed in! 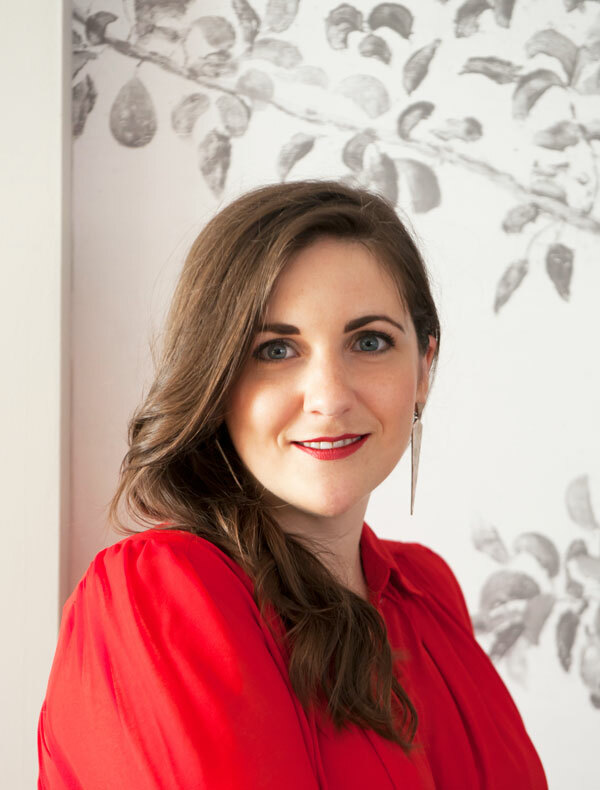 Thanks for following along, hopefully I've left you with some practical tips on how to get the boutique hotel look in your bedroom AND some places to add to your travel list. I'm not sure when I'll make it to Europe next, but I am excited to head to Rhode Island next week and stay at the Dean Hotel in Providence. From there I'll head to Block Island to stay at The Darius Inn owned by my dear friend and very first roommate in college. Good Night and Bon Voyage!